Chicken skewers: fun, easy to make, and tasty! Wrap the chicken around the cheese, the result is delicious! Cheese; chicken breast; flour (as needed); eggs (as needed); breadcrumbs (as needed). 1. 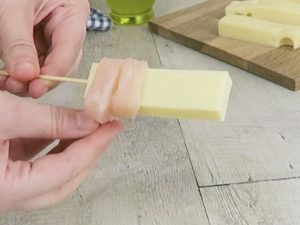 Slice the cheese into rectangles and slide them onto the skewers. 2. Slice the chicken breast into strips and wrap it around the piece of cheese. 3. Cover with the flour, dip it in beaten egg and finally cover in breadcrumbs. 4. Deep fry for a few minutes or until golden. Or, you can also bake them at 180°C for about 25 minutes. 1 zucchini; 350g ground chicken; salt; pepper; paprika; parmesan cheese; 1 egg; cheese. 1. Slice the cheese into rectangles and slide them on to a large wood skewer. In the meantime, grate a zucchini. 2. Season the ground chicken with salt, pepper, paprika and mix in an egg. If the mixture is too runny, add some breadcrumbs. 3. Cover the cheese on the skewer with this mixture. 4. Cover them in breadcrumbs and bake at 200°C for 20 minutes. 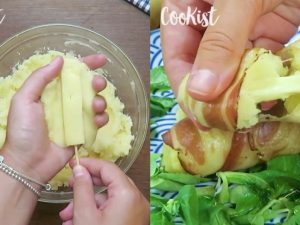 Skewered mashed potatoes: the recipe for a quick and easy to prepare dinner!